Chin Liposuction is best suited individuals with fat deposit beneath the chin. This gives a "double" chin look. Chin Liposuction removes fat from "submental" region or below the chin. This is an outpatient procedure done under local anesthesia. It is performed in 30 to 60 minutes. The results are permanent, since fat cells are physically removed, so there is no area where fat can be deposited. This is an excellent procedure to give facial definition and definition to the jawline. Get the best double chin removal surgery in India at Image Clinic. 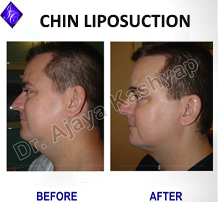 For any kind of enquire about chin reduction surgery please complete our contact form or call +91-9818369662 or +91-9958221983.